KIEV, Ukraine -- Ukraine will probably receive the next payment from its emergency loan from the International Monetary Fund in May, Prime Minister Mykola Azarov said. “We hope to restore cooperation in May,” Azarov told reporters in Kiev today. He declined to comment on the possible amount of disbursement. The government will try to cut the budget deficit to 6 percent of gross domestic product this year, Azarov said. The country was forced to turn to the fund for a $16.4 billion emergency loan in November 2008 to stay afloat after the global crisis undermined demand for its exports, mainly steel, and hit about 20 lenders. Part of the $10.6 billion which Ukraine has received so far was used to cover budget spending. The IMF won’t set requirements on spending and instead sees 6 percent of GDP as a general target, said Azarov, who met the head of the Washington-based lender’s mission Thanos Arvanitis yesterday. “It’s our internal business on how we reduce the budget gap” to 6 percent, he said. The IMF supports Ukraine’s bid for a new program with the lender once the country receives all of the $16.4 billion stand- by loan payments, Arvanitis said yesterday, according to the government’s Web site. Ukraine needs a new program to “reform the economy,” Azarov said last week. 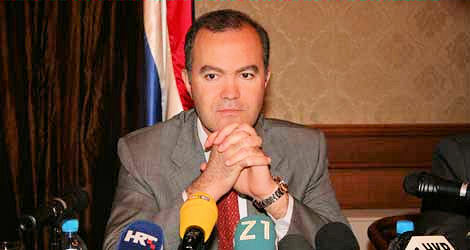 The prime minister wants the economy to reach “pre-crisis’ growth rates in the next two and a half years, he said today. GDP grew 7.9 percent in 2007 and 7.3 percent in 2006. Ukraine’s economic contraction slowed in the fourth quarter to an annual 6.8 percent, compared with a 16 percent drop in the third quarter and a record 20.3 percent decline in first three months of the last year, the Kiev-based committee said in a statement on its Web site yesterday. The economy of the former Soviet state declined an annual 15.1 percent in 2009. A Ukrainian delegation led by Deputy Prime Minister Serhiy Tigipko is going to attend the IMF annual meeting on April 24- 25.